A spill of gasoline, diesel fuel, brake and transmission fluids spilled on asphalt will immediately begin to dissolve the binder that holds the aggregate together, as shown in Figure 1. There is no known method to reverse the dissolving process. Asphalt is made using an aggregate mixed with heavy oil or bitumen, which are both hydrocarbons, and hold the aggregate together. In other words the hydrocarbon acts as a binder. In many cases the heavy oil or bitumen is thinned by the addition of a lighter hydrocarbon product such as paraffin, gasoline or in some cases pine tree oil - turpentine. What is even worse is that the spilled fuel or fluids will continue to seep deeper into the asphalt destroying the integrity of all of the asphalt that it comes in contact with. In as little as 48 hours a fuel spill can and will eat through three inches of asphalt. The result is an area where the aggregate is no longer bound together meaning that there is no longer a hard surface. At this point a sharp object such as a screwdriver or stiletto heal will easily penetrate the asphalt and as a vehicle drives over that section of asphalt, aggregate will be dislodged and end up scattered everywhere. Once a damaged area occurs in the asphalt it expands because the good edges of the asphalt crumble off as vehicles drive over the damaged section. The longer that the bad section is allowed to remain the more damaged that will be incurred. Hence, time is of the essence in repairing the damage caused be a gasoline or other similar spill. Note: Asphalt cannot be invisibly repaired. Overtime the repair will be less noticeable, but it will always be visible if you are looking for it. Using a chalk line mark a rectangle around the damaged asphalt area that has at minimum four inches clearance between the edges of the damaged asphalt and the rectangle, as shown in Figure 2. Using a gas powered cutter, as shown in Figure 3 or if you have a larger area to cut you can use a wheeled power cutter as shown in Figure 4, with an asphalt blade, cut on the lines of the rectangle to a depth just slightly below the depth of the asphalt. 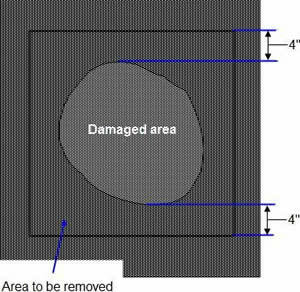 All of the asphalt material that is in the rectangle must be removed, as shown in Figure 5. 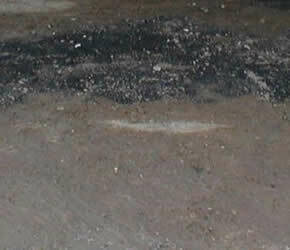 Visually inspect the material below the asphalt and remove any that may be contaminated. Note: Do not place the material that you are removing from the asphalt on top of good asphalt as this will damage the good asphalt! It is best to have a disposal dumpster available to place the contaminated and damaged material in directly as it is removed. Note: Gas powered saws suitable for cutting asphalt are available at most equipment rental facilities. Note: Wear proper safety goggles, gloves, shoes and clothing when working with gas powered saws and cutting asphalt. Note: The asphalt and any accompanying material below the asphalt that has been removed must be disposed of in a method acceptable to your municipality’s by-laws. If you had to remove any of the material that was beneath the asphalt replace and compact it using a tamper as shown in Figure 6. Make sure your working area is clean of all debris before proceeding. You do not want to contaminate any of the new materials that you will use for the repair of the asphalt. 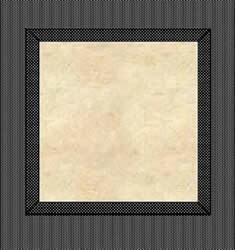 Prime the vertical edges of the rectangle with a cold pour material. Cold pour is a jointing compound used to bind asphalt to itself. It prevents the ingress of water into seams or cracks in asphalt. Pour in a quantity of cold asphalt about 2/3 of the depth of the hole that you have made. Tightly compact the cold asphalt using a tamper, as shown in Figure 6. It is critical that the materials be tightly compacted. Note: Cold asphalt or pavement repair is available at most building supply centers in 50 lb. bags. Fifty pounds of cold asphalt will fill an area approximately 16 inches square 3 inches deep. It will take about 6 bags cold asphalt to cover a square yard of area 3 inches deep. Note: Cold asphalt and pavement repair materials are really not suitable for repairing and repairing asphalt in areas that are larger than 2 square yards or 18 square feet. If you have an area larger than 18 square feet you should consider using hot asphalt. Once you have the first layer tightly compacted immediately add the finishing layer and compact it level to the existing asphalt. Add additional cold pour compound to the joint to ensure that the area between the old and new asphalt is completely sealed. Note: Both the cold pour compound and the cold asphalt can remain sticky for a number of weeks. Avoid walking on the materials as you will track them into your home and vehicle. To prevent tracking the materials into your home or car you can apply a light dusting of fine sand, in the same manner as applying flour to a pastry board to prevent the dough from sticking. Over time the sand will wash off the surface due to rains or just washing the area with a garden hose.